to kill you and are move there to find you. You have to save your life and protect your country from destruction. On the battlefield,you have to counter attack on your enemies from the distance or use your shooter rifle and strike enemies from closer distance. Master challenging objectives in Gun, Riffle, Rocket Launcher and Minigun missions to clear jungle area. Destroy valuable military targets using snipers, machine guns,jeeps, tanks and gunner helicopter. - Tap the shooting button for fire. - For enemies at far distance, use the telescope. - Detect enemies by the help of radar and Map. - Select arms of your choice by tapping on there buttons. - Follow the instructions from GHQ carefully. - Destroy jeep full of soldiers and rocket cannon can bomb jeep easily!! 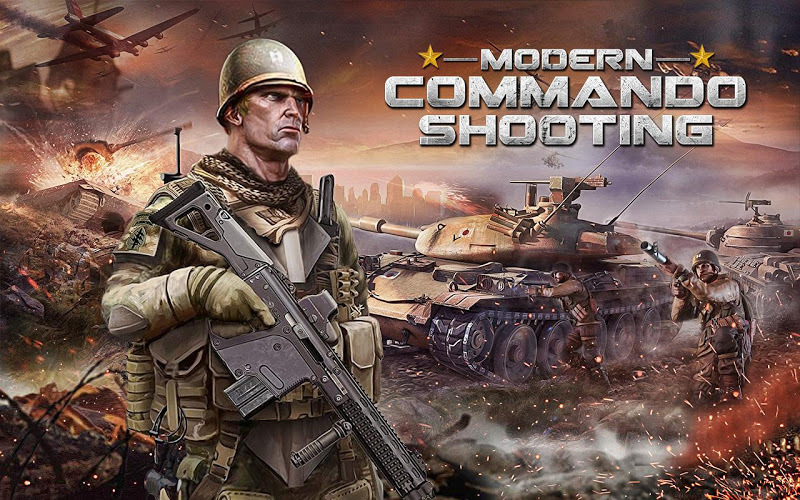 Don't wait and start playing exciting Modern Commando Combat Shooting. Modern Commando Combat Shooting is amazingly dynamic and satisfying. Modern Commando Combat Shooter: install APK and play the game!